Key West Dive Center will explain the differences between scuba diving certifications offered in Key West. The courses include top of the line scuba diving gear, hands-on learning in small classes with certified trainers, and beautiful training dives amongst the spectacular living reefs of Key West. The Key West Dive Center currently offers an Open Water Scuba Diving Certification, Advanced Scuba Diving Certification, Refresher Course, Check Out Referral Dive, and Discover Scuba Diving Resort Course. Completion of the most popular diving course in the world leads to a highly-regarded Open Water Diver certification. With this certification, divers are able to enjoy endless scuba diving opportunities in Key West and throughout the world. This course has three main phases: knowledge development, confined water dives, and open water dives. During knowledge development, the diver will learn the basic principles of scuba diving in the classroom or via e-Learning online classes. Divers start from scratch and learn about the technical gear used while diving Key West, such as the scuba unit and dive computer. Students discover the purpose of the weight system, regulator, tank, and buoyancy control device. This phase explains the importance of pressurization, what factors to consider before diving, and how to respond correctly in a variety of underwater situations. Additionally, divers explore the differences in gear and techniques used in tropical, temperate, and cold water climates. By understanding the fine details of the dive process, trainees will develop into competent divers with a well-rounded knowledge and skills. The confined water dives are used to develop basic scuba diving skills including how to put on scuba gear, techniques for controlling buoyancy, how to clear a mask full of water without surfacing, when to pressurize the body while diving, and how to monitor critical pieces of equipment such as oxygen gauges. Emergency skills, like mask replacement and air sharing, are also practiced with great care and explanation. 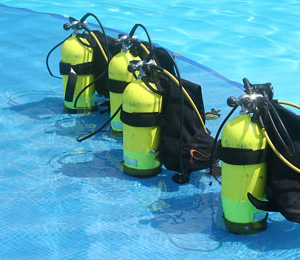 Confined water dives take place in a pool or pool-like Key West dive conditions. The final part of the course involves completing open water dives under the supervision of trained experts. The diver will get to practice all of the skills learned in training while enjoying the breathtaking underwater beauty of diving Key West. The Advanced Open Water Diver certification is perfect for enthusiasts who have completed an Open Water Diver certification and would like to advance their diving knowledge. 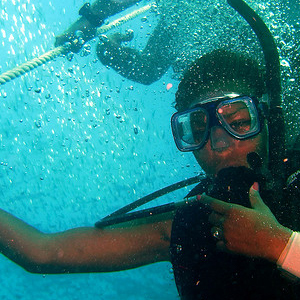 The advanced course requires divers to complete supervised dives with a Instructor while honing adventure dive skills. The course includes three morning wreck and reef dives with a Instructor which completes the requirements for Wreck Diver and Deep Diver specialties. Additionally, divers learn underwater navigation skills using an underwater compass, dive computer, and visual landmarks. Divers have the option of learning Peak Performance Buoyancy or Underwater Naturalist skills in order to complete the Advanced Open Water Diver certification. The advanced class trains divers to explore waters as deep as 30 meters. Divers learn the practical andphysiological aspects of deep diving, how to navigate using kick-cycles, and effective utilization of a plethora of new gear ranging from underwater cameras to dive flags. The course allows divers to experience Key West's living reefs and wrecks with five dives total. A low student to Instructor ratio means that divers will have the ability to greatly progress their diving knowledge and skills in a comfortable environment. The Refresher Course is a fantastic option for divers who have been out of the water for a while. The morning refresher course covers all of the necessary skills to get a diver back in the swing of things. The course is completed in the safety of a swimming pool with the guidance of a certified Instructor. Divers refresh emergency shared breathing skills, buoyancy control, and other critical diving techniques. The course reviews essential equipment usage including: mask, fins, snorkel, buoyancy control device, regulator, cylinder, submersible pressure gauge, alternate air source, compass, and the dive computer. 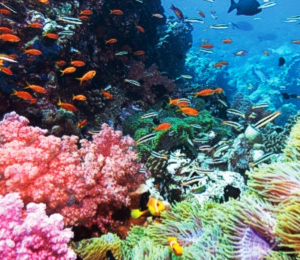 Afterwards, divers are able to enjoy two tanks of reef diving in the legendary Key West waters. The Check Out Referral Dive is designed for divers who have already begun working towards their Open Water Diver certification. Instructors assist in the final stages of the certification with pool training sessions and afternoon guided diving trips. Divers complete their certification requirements while enjoying the gorgeous living reefs of Key West. This course is designed for vacationers who would like to experience scuba diving in Key West without having to complete a multiple day course. Divers receive pool training and instruction from Instructors on the basics regarding equipments, dive techniques, and simple skills. After the two hour pool training session, divers are able to enjoy the only living coral reef in North America with two single tank afternoon dives. The course includes instruction in small classes, two dives, all scuba gear rentals, and the boat trip to the dive sites. This option is perfect for those who do not need a certification or divers who are short on time. The correct course or certification depends on the skill level and previous training of the diver. 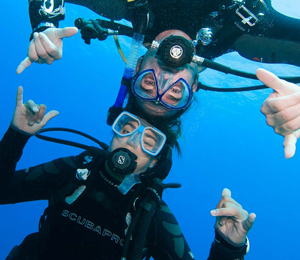 The dive center offers a variety of certification courses including the Open Water Scuba Diving Certification, Advanced Scuba Diving Certification, Refresher Course, Check Out Referral Dive, and Discover Scuba Diving Resort Course. The dive center provides many options to accommodate the mixed needs of those wishing to enjoy the underwater beauty of Key West.